In a game with the Witness, a reversal to the end may take place. If the "Key Evidence" and "Means of Murder" are solved correctly, the Murderer, after dicussing with the Accomplice, picks a player (to have quietly killed before the trial). If the chosen player is the Witness, the Murderer and Accomplice escape conviction and win the game. If it is any player other than the Witness, they are convicted successfully and the Forensic Scientist and Investigators as well as the Witness win. 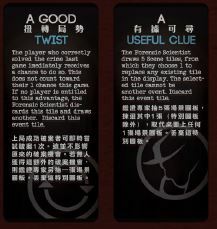 To play with the Event tiles, the Forensic Scientist should shuffle them into the deck of Scene tiles after the First Round of Evidence Collection. In this way, an event may occur during either the Second or Final Round of the game. When playing with the Event tiles, simply read the text aloud and follow the instructions when drawn. To make the game easier for the Investigators, deal 3 Means cards and 3 Clue cards to each player. To make the game harder for the Investigators, deal 5 Means cards and 5 Clue cards to each player. The Forensic Scientist may not convey information in any way other than through the placement of the Bullet markers on the Scene tiles and answering "yes" or "no" to an attempt to solve the crime. Players may not interrupt one another during the Presentation phases - except to attempt to Solve the Crime. During the Evidence Collection phases, players may speak freely. Asking questions of each other is permitted. Answering is optional.